Oh, the world didn't end yesterday? 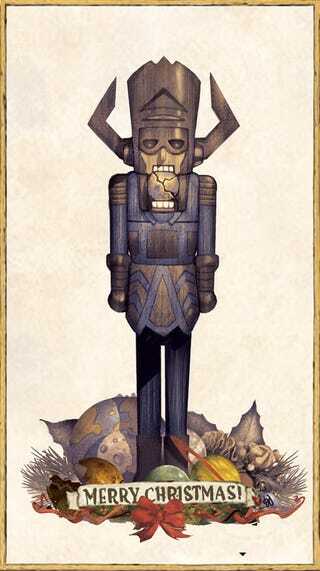 Nutcracker Galactus will take care of that. Galactus is here to deal with the planetary destruction overlooked in this week's non-apocalypse. Not only that, he'll do it in festive attire, imitating a holiday nutcracker. Mike Del Mundo wishes the world a Merry Christmas with this planet-crunching nutcracker piece. A Very Special Card Wishing You Happy Maya Non-Apocalypse Day!